This week I accompanied my grandchildren Hailey and Demetri to the Oakland Zoo. 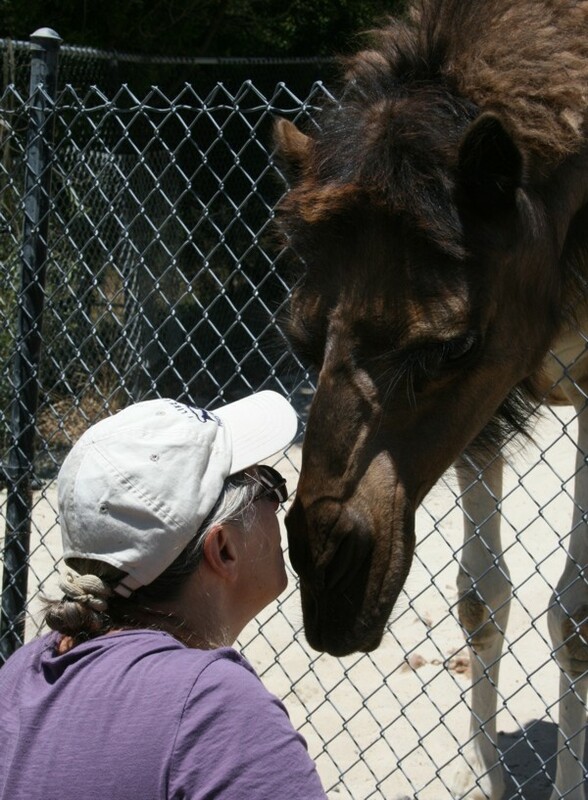 I hadn’t been in years, not since their parents were children, and I was tremendously impressed by the facilities, which were carefully designed around the needs of each species or compatible group. 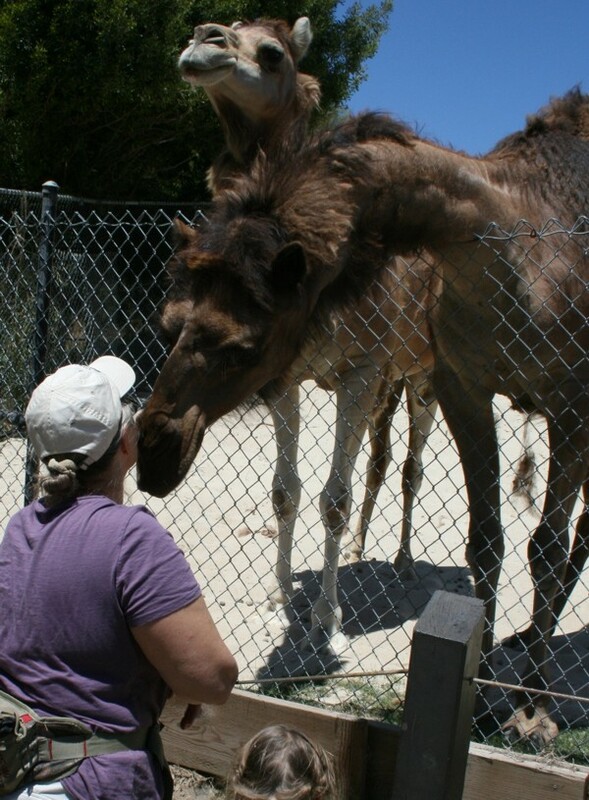 But off in one corner, rather an afterthought, was a nothing-special exhibit for the camels. 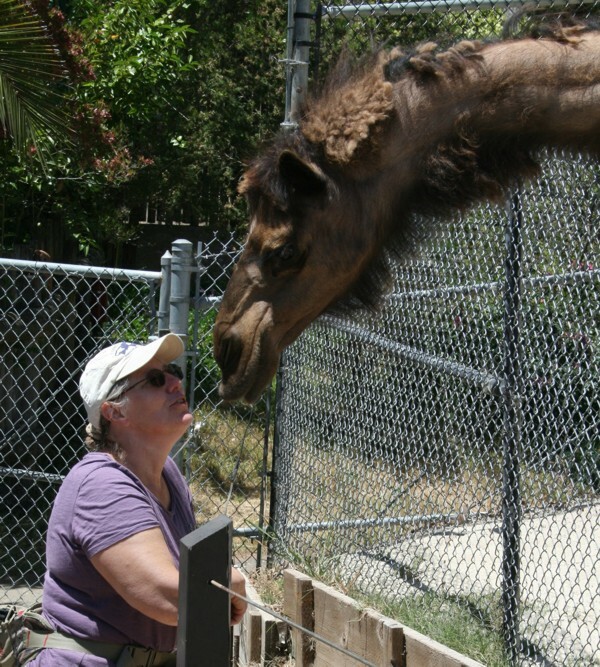 Because, in zoo terms, dromedaries (that’s the one-hump camel) are nothing special. I suppose they are only there because to a wide-eyed child, a camel is just as unusual as a panda. 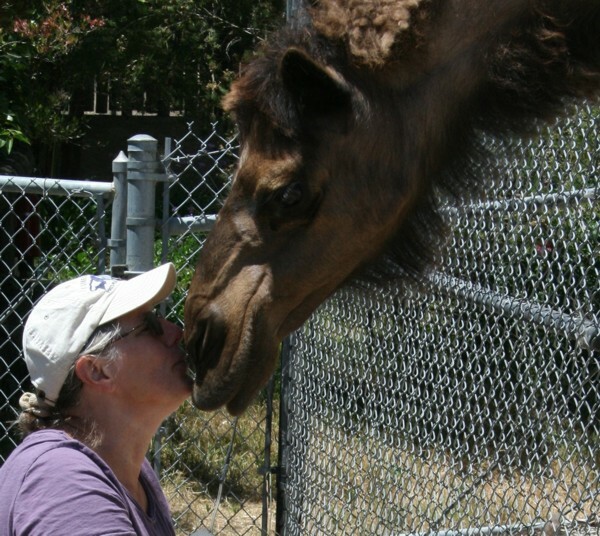 As a long-time breeder and trainer of llamas (camelids, or ‘little camels’) I made a point to go see them at the dead-end of an uphill climb. They had three, but my eye immediately went to a dark bay who was harassing another one. 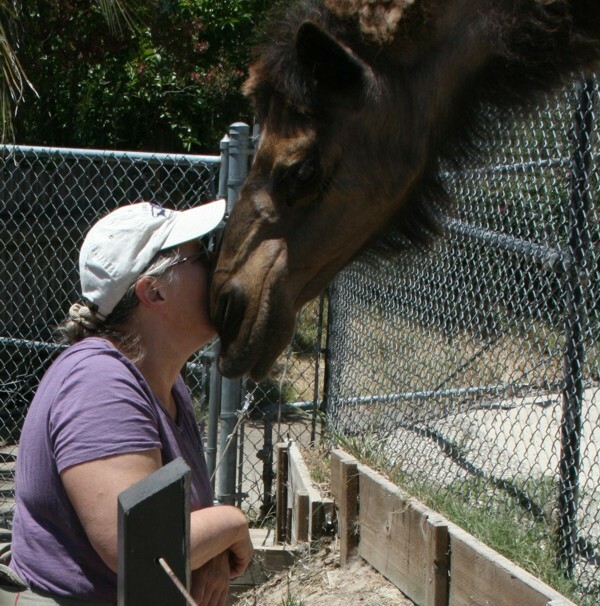 Years of watching herd interactions gave me the context: Darkbay was an adolescent female, and she wanted to play. The elder was putting up with her with a patience which only a mother would muster. There were several other people at the fence, but Darkbay’s interest was immediately piqued. She came over at once, and we had the following conversation, here translated into English for the benefit of those who cannot read Camel. Me: Hi honey. If your Mom hasn’t any time for you, I’m a listening ear. Darkbay: That’s weird. Usually the two-legs holler and point. But you seem very polite. You aren’t going to grab at me, are you? Me: No, I’ll keep my hands to myself, until you invite me. And here’s a whiff of my breath. Me: If you come a little nearer, I’ll tell you a secret. Darkbay: Ooo, I love secrets. And you have the most aromatic ear-wax! What’s the secret? 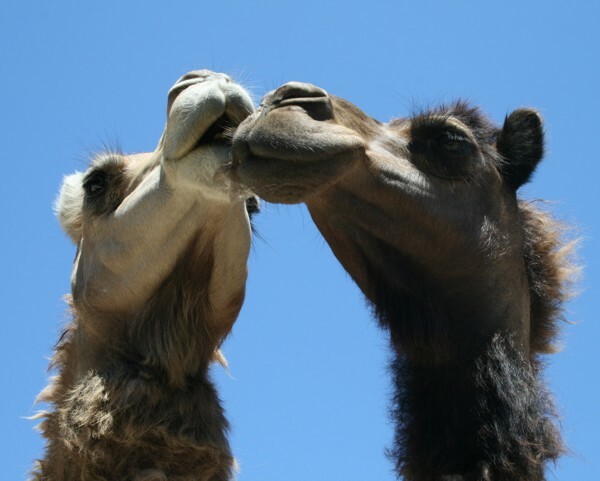 Me: I’m VERY fond of camels. I have bunches of little ones called llamas. You can smell them on my cap, I wore it on my last packtrip. Darkbay: I like you too! Lots and lots! Let’s have a kiss. Me: (twitching lips, llama style). Kissy Kissy Kissy. Darkbay: Why don’t you come live with us? I’m bored. None of the grown-ups will play. Me: sorry, the fence is in the way. Momcamel: (Coming over). Now dear, stop pestering the two-legs. You know some of them spit. Me: Ma’am, I understand your concerns completely. I have llamas, and whenever we go out in public there is always some brat who spits at them, trying to get them to spit back. Darkbay: Mom, that was fun! 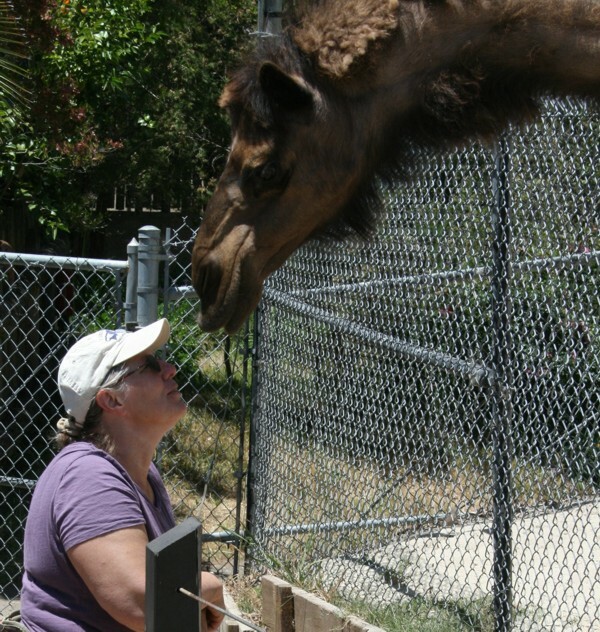 Momcamel: Yes, dear, there are a few polite humans in the world. Many thanks to my daughter-in-law Heather, who never misses a good impromptu photo shoot.